With an ORAC score of 116,000 Organic Cacao Nibs are super rich in antioxidants, with twice the amount of potent antioxidants than traditional cocoa powder, 25 times more than Goji berries and 27 times more than found in blueberries. It is also one of the richest sources of magnesium in the world. Cacao is also a great for stimulating the happy neurotransmitters of our brain such as serotonin, dopamine, anandamide and phenylethylamine (PEA), which aid feelings of happiness and well being. Both PEA and Anandamide (the bliss chemical) are found in abundance in the brains of happy people. 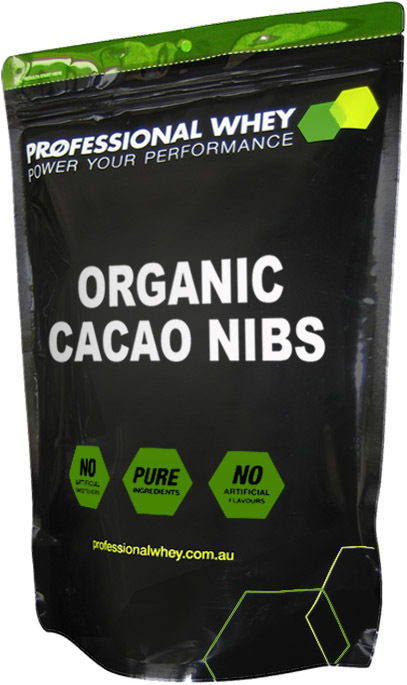 Our Organic Cacao Nibs are also rich in zinc, omega 3, aminos, beta carotene, calcium, chromium, iron, copper, sulphur and potassium. Now you can have your chocolate and be healthy and happy:). If you eat these in combination with our organic cashews, you have a taste sensation!! Eat as a snack or add to any protein shake or dessert for extra crunchy texture! 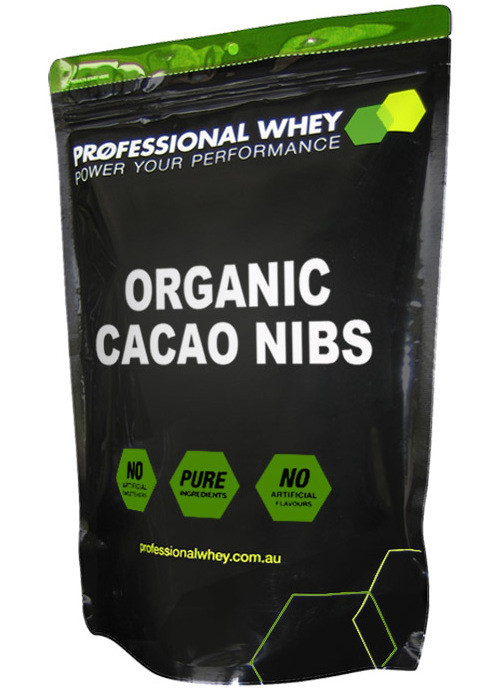 First time purchasing this product from Professional Whey and can’t speak highly enough of these cacao nibs. When first opened they smell like the most amazing chocolate. They are really fresh and crisp. The whole family enjoys sprinkling these over breakfast or blending into a protein shake. So much better than other brands I have tried. I enjoy the bitterness and the cocoa-y aftertaste. I add these to my nut muesli, or include in a teal mix of goji berries and pumpkin seeds for a snack. I'll keep buying them! I was intrigued by these and really didn't know what to expect as I had never tried raw cacao before. They taste super cocoa-y without a hint of sweetness at all, quite bitter and a super crunchy texture - actually barely tastes like chocolate at all! As a lover of super-dark chocolate, I was actually surprised that I wasn't a fan of them on their own! But I have found many uses for them in my raw (and sugar-free) sweet treat concoctions! After reading the reviews I thought I'd give these little nibs a try. I'm not quite sure what I expected but it wasn't them. First they're incredibly bitter, really tiny, not uniformed in shape, and much crunchier than I expected. It's not a bad thing, but if you expect them to be like commercial choc bits (which are more bit than real chocolate) then you'll be disappointed. They're not, and they're better. No sugar or added fat means you can add them to almost anything to give it a subtle chocolate flavour without the added nasties. And as a complete foodie I'm now starting to think up all sorts of gastro uses for these little gems. What a revelation. I have been eating these with everything recently, throwing them in my coffee, sprinkling over salads, or just eating by themselves. They really do make you feel happier its no joke, which is helpful for sitting in an office all day. The bitter taste is delightful and I would recommend a try for anyone who is even slightly interested.